The boarded up, mid-rise brick building across from the North Avenue entrance to Bobby Dodd Stadium was built as student housing in the 1940s. 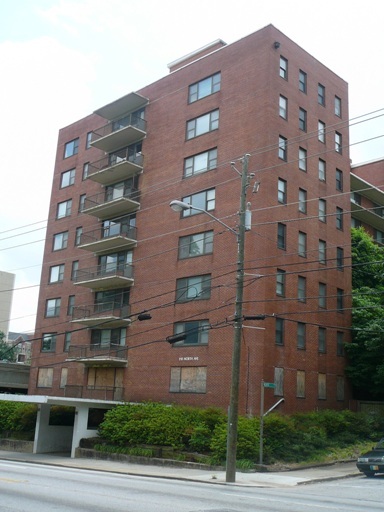 It is one of the first modernist buildings designed by the firm of Burge and Stevens, which also created the 1938 Peachtree Hills Apartments that were razed in 2008. Georgia Tech indicated in its 2004 master plan that it intends to demolish the building, but a recent discussion with the State Historic Preservation Division staff and representatives from the Board of Regents staff did not end in a consensus about the fate of the building. The Historic Preservation Division has stated that Georgia Tech is not in compliance with the GEPA process, having overlooked a feasibility study for the adaptive reuse of the facility. The school has engaged the consulting firm EDAW to suggest alternatives to the demolition, including no action and re-use options. This building has been demolished and is now a parking deck.